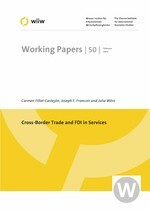 Working with a panel dataset of OECD countries over the decade 1994-2004, we examine linkages between cross-border trade and FDI in the services sectors. We first develop a consistent analytical framework for the application of the gravity model to both services trade and commercial presence (i.e. FDI), using a composite model of delivery that offers testable hypotheses about the roles of different modes of services supply as complements or substitutes. We further link our estimates to policy variables measuring market regulations that may act directly or implicitly as barriers to trade. We find robust evidence of complementary effects in the short run, which is reinforced in the long run by an increased potential for cross-border imports based on previous FDI inflows. A detailed analysis by individual services sectors highlights business, communication and financial services as showing the largest potential for cross-border trade when market regulations are reduced and when commercial presence increases.